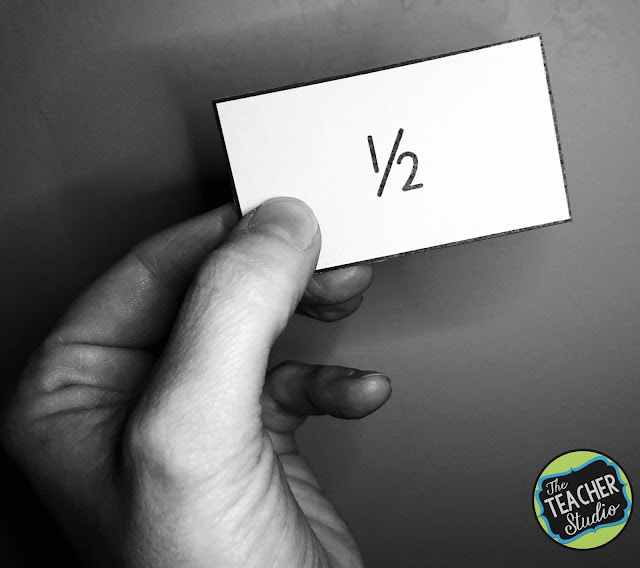 What makes teaching fractions so challenging? If you have followed me or seen any of my webinars, you know that I wholeheartedly believe that all students can learn math at a high level–and we, as teachers, need to constantly strive to refine our teaching strategies and methods so that we reach ALL students…no matter their starting point. This is especially true for fractions which can be one of the most challenging things we teach. 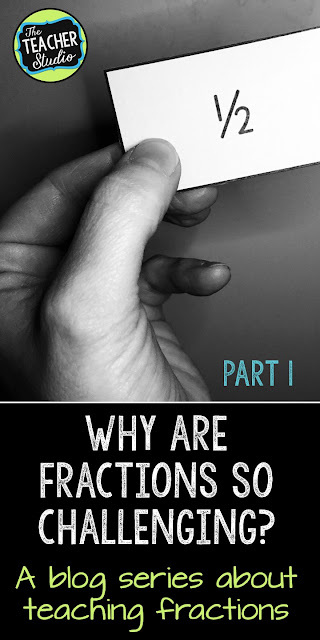 This post begins a series about fraction instruction that I hope you find helpful and meaningful. To begin, I don’t think it would be surprising if I told you that a majority of intermediate grade teachers declare that fractions are one of (or THE) most challenging concept for them to teach–and for their students to learn. So why is this? And more importantly–what can we do about it?! These questions will be the foundation for this series of blog posts. We CAN make a difference in how we reach our students and deepen their fraction knowledge. 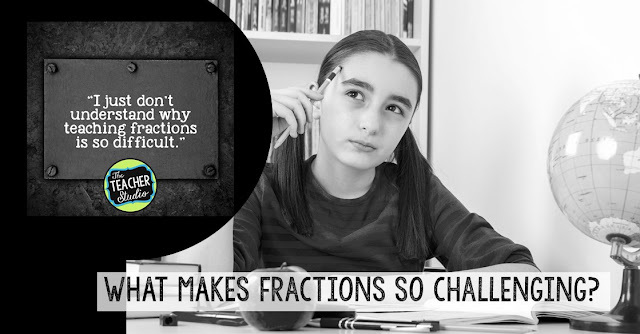 What makes fractions so challenging to teach? Fractions are not always “concrete”. 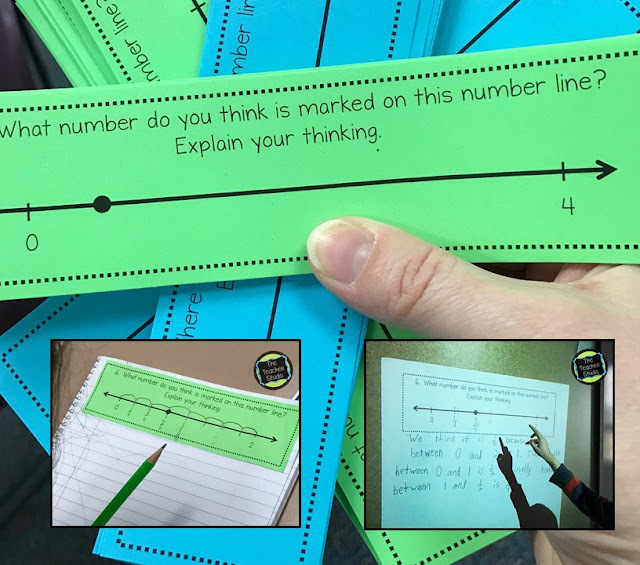 Although we may start our fraction instruction with objects–perhaps paper folding or plastic fraction pieces–we too often move very quickly past these real-world models to paper and pencil computation. I’m going to argue that even drawings of fractions fail to be concrete enough for some students with limited fraction sense. To many, this is just a circle with lines. The physical act of cutting, folding, and manipulating is so important for many. To make matters more complicated–this is just the beginning! When we multiply whole numbers, we can make “groups of” objects, right? 3 times 6 can be represented by 3 piles of 6 objects. Do we take the time to really make our more advanced fraction concepts such as multiplying and dividing concrete? Do students really “see” what happens when we multiply fractions (HINT: We can still model 3 groups of 1/4 or 6 groups of 2/3…and it can make a huge difference!). When we move too quickly to “bare numbers”, we make a lot of assumptions about what our students truly understand. Here’s another statement that seems a little obvious, right? Of course, fractions are numbers! But wait…try to get yourself into the mindset of a struggling student. We show them pictures of pizzas and candy bars cut into little pieces. We talk about the pictures in different ways…and we help students learn to “label” them as representing 1/5 or 3/8 or whatever the picture represents. Do we really help them understand that fractions allow us to represent real numbers–and even parts of numbers? That when we have a drawing of 3/8, it means that we have LESS than a whole object or amount? That fractions allow us to show amounts BETWEEN whole numbers? This is a critical part of fractional understanding; the drawings we use to show fractions are merely representations of numbers from a number line. More to come in upcoming posts. “1” in the numerator…such as 1/4, 1/7, or even 1/500. Understanding that this is “unit” of measure or amount is so critical. 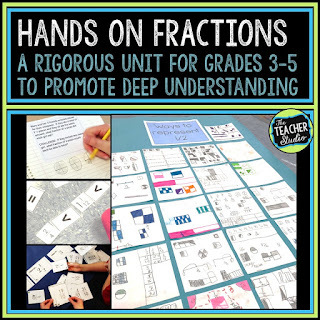 I like to interchange the terms “unit fraction” and “counting fraction” with my students because I really want them to understand that, just like whole numbers, unit fractions can be counted, added, subtracted, composed and decomposed–and more. In the primary years, a great deal of time is spent counting whole numbers in different ways–by ones. By 5’s. By 10’s. We even practice counting backward which helps develop subtraction understanding. The same is true for fractions–and we really cannot make assumptions that all our students can do this automatically. When we count fractional parts (“unit fractions”) using manipulatives, on number lines, and even orally, it helps build that understanding that fractions are numbers. It helps students begin to develop their sense of the relative size of fractions. It helps lead to a greater understanding of what happens when we count and get the same numerator and denominator (a new “whole”) and then count past that to make improper fractions and mixed numbers. When we can count fractions we start to see the additive nature of them…I have 2/5 and I count up one more fifth and get 3/5–and this is something that can often be missing in student understanding if time isn’t spent working on this. 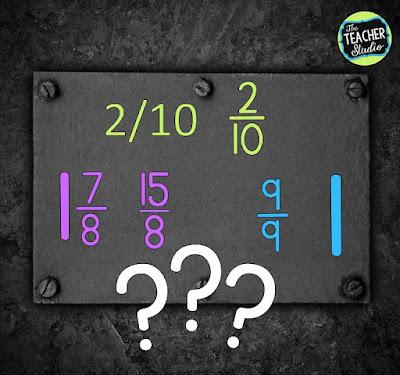 It really forms the foundation for addition and subtraction of fractions–and is truly an essential skill. In fact, this is one of the first interventions I do with students who are struggling. I get out a manipulative of some type (I linked to some of my favorites…note, these are affiliate links) and we practice counting. We notice what happens when we reach a “whole” and then beyond. We essentially “play” with these counting fractions and then begin to record our findings on paper and pencil. I will often pull these back out when reteaching is needed. Also, consider when you look for manipulatives that some have the fractional part written on them and others are blank–both are great, but make your decisions based on what you want to accomplish. Similarly, if you ONLY use circles or ONLY use fraction bars, students may struggle to generalize the learning. Even using tools like pattern blocks can be really helpful as you study basic fraction concepts. So, when talking about playing with unit fractions and counting fractions, I mentioned that I work to connect the physical fractions (fraction circles, folded paper, etc) to the written symbols–and this leads me to yet another challenge associated with fractions–notation and terminology. We throw around words like “numerator” and “denominator” and sometimes forget that students may not have internalized those terms and have most likely never heard them. Words like “equivalence” and “improper” and “reduce” can also add to the confusion. If you see my other posts from the past (or other lessons from my fraction unit)To make it worse? We can write fractions in different ways! Check out the image below–and then think through the lens of a struggling mathematician. Both of the green fractions represent the same thing–but they are written in two different ways. One, if written carelessly, could end up looking like 2,110–the other is easy to read but difficult to make using technology. How about the purple ones? Students need to understand that both of those are the same value–written in two different ways. Even understanding that the “1” is a “whole” and the 7/8 represents part of another whole can be confusing for many. We need to be constantly assessing for this type of misunderstanding. Finally, with a tie back to unit fractions, students need to understand that one “whole” is the same as when it is notated with the same numerator and denominator. We cannot make assumptions that this understanding is in place. Dig in and find out–and fix any misconceptions along the way. I’m almost finished–I promise! I know so many of these things seem trivial–but if we don’t catch them in our strugglers, we just keep moving them forward with an unstable foundation–and we KNOW that really understanding fractions is the key to success in algebra and other upper math classes. We can’t fail our students! Another frustration for students is that fractions appear in so many contexts. 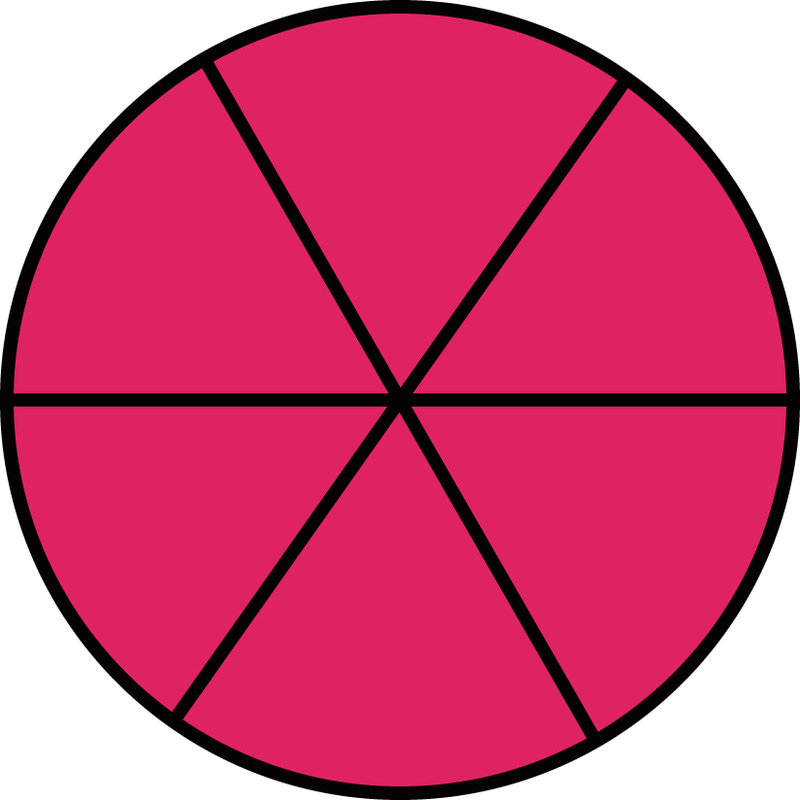 We can divide a pizza in fourths. And we can divide SETS of things (like bags of jelly beans or baseballs) into groups. Also, we need to use fractions of more abstract things like units of measure–like fractions of an inch or a pound. It’s no wonder students get confused–1/2 can mean so many different things! Even thinking about 1/2 of a pizza…is it a 7 inch pizza? A 16 inch pizza? Are those halves the same? What about 1/2 of the pizzas in the restaurant? Or half of a slice? Because 1/2 can VARY, this is extremely confusing to many students. In fact, this challenge forms the foundation of a great deal of the fraction work I do in my class–to really help students grasp how fluid fractions are. You can see lots of examples of this in my complete fraction unit that has been such a game changer for me and literally thousands of teachers who have used it. A growth mindset is missing! This is perhaps the hardest to overcome. Students aren’t born thinking fractions are hard–somewhere along the way, they have gotten this message. Whether it be from their families (“I was terrible at fractions, too!”) or the way we, as teachers, present the information–somehow we are sending messages that fractions are our nemesis, something only to be understood by the lucky ones. We have to think about our own biases and make sure we are NOT sending those fixed mindset messages to our students. Fractions ARE accessible to everyone…but we do need to make sure that we build and nurture a strong foundation of understanding and a mindset of growth and perseverance. I hope I gave you some things to think about today–and stay tuned for more fractions posts coming soon! Want to check out the unit I was referring to? 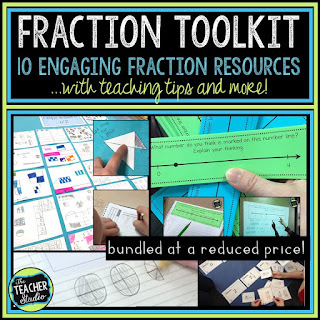 Or maybe check out a bundle of 10 fraction resources I use to help build this understanding?